View of the vicarage at Northleach in Gloucestershire. This belongs to the parish church of St Peter and St Paul, which is located at the centre of the town near the market place. Northleach prospered because its market was a centre of the late medieval wool trade. This allowed a wealthy local wool merchant John Fortey, to sponsor the building of an impressive and lofty parish church in the fashionable 15th century Gothic Perpendicular style. 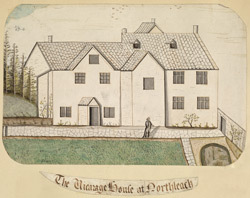 The vicarage is a large, although more modern building.